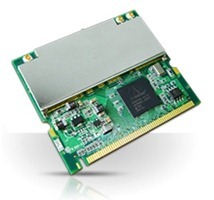 EMP-9602 is a 11b/g/n mini-PCI type III A module with Atheros 802.11n AR9160+AR9103 chipsets, which combines the MAC, baseband processor and 2.4G Transceiver. It supports the high transmission data rate and reliable performance of 2x2, 2x3 and 3x3 radios which are ideal for streaming multimedia applications. EMP-9602 supports 130Mbps and 300Mbps in 20MHz and 40MHz channel operations respectively. It provides 2 stream MIMO configuration, which is easy to implement to integrate into AP, Client bridge and embedded system. The card also features WEP, WPA-AES hardware-based and TKIP security capabilities.